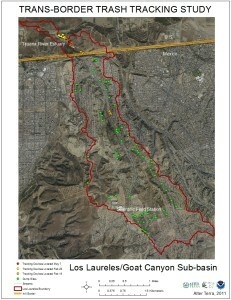 The Los Laureles Canyon sub-basin is part of the Tijuana River Watershed. This watershed is the western-most watershed in a set of trans-border drainage basins that define the nature of the U.S.-Mexico border region. What makes the watershed’s location significant is that it’s divided by an international border with 25% of the watershed located in the U.S. and 75% located in Mexico. This watershed is inclined topographically to the west, so all Tijuana River streams drain towards the Pacific Ocean (Wright, et al. 2005). 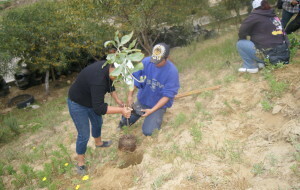 And drainage is what makes Los Laureles Canyon significant because all streams in this Canyon, with its elevation of 700 feet above sea level, drain into the 2,500 acre reserve at the Tijuana River Estuary. This is a drainage system created by natural hydrology and topography. Nature causes solid wastes originating in the Los Laureles canyon to drain into the Tijuana River and flow across the U.S. border toward the Pacific Ocean. The flow is unstoppable. However, now that we have identified this canyon as the location for approximately 100 unmanaged dump sites, we can work toward controlling the flows of solid waste. The answer lays in the eradication of illegal trash disposal through strict policy enforcement and sustainable infrastructure development. 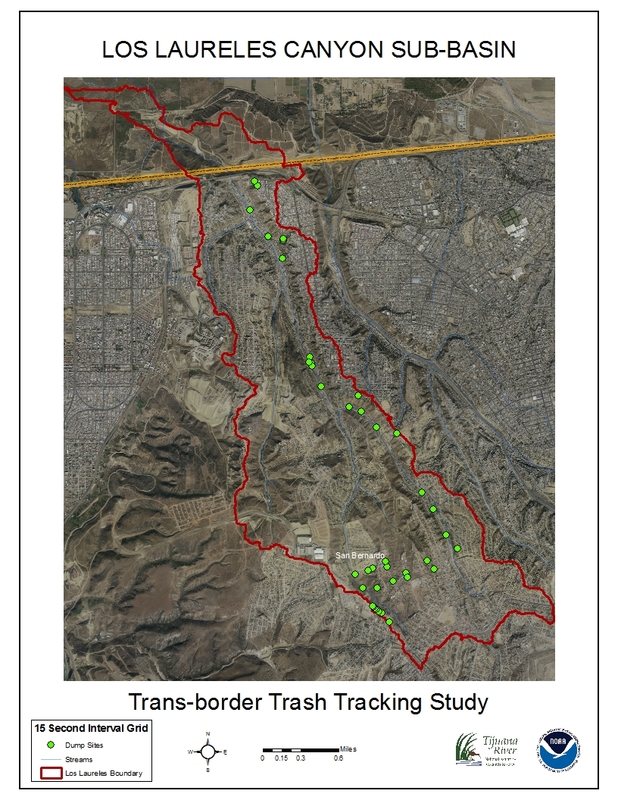 Although previous studies have cited the problem of border-area solid-waste pollution, a lack of substantial published literature on the subject of trans-border waste management creates a need for case studies like the Los Laureles Project. In order to strengthen anti-dumping laws and enforcement in the border region, government officials require a scientific record of the refuse problem. Our study has produced that record. There are fourteen pairs of U.S.- Mexico border cities that suffer similar effects of solid waste pollution and trans-border flows found in Los Laureles, so the benefits of finding a solution to providing local enforcement of environmental protection ordinances in Mexico will be far-reaching. Lessons learned from this research can now be used to create an international model for waste management in other trans-border watersheds along the U.S.- Mexico border. 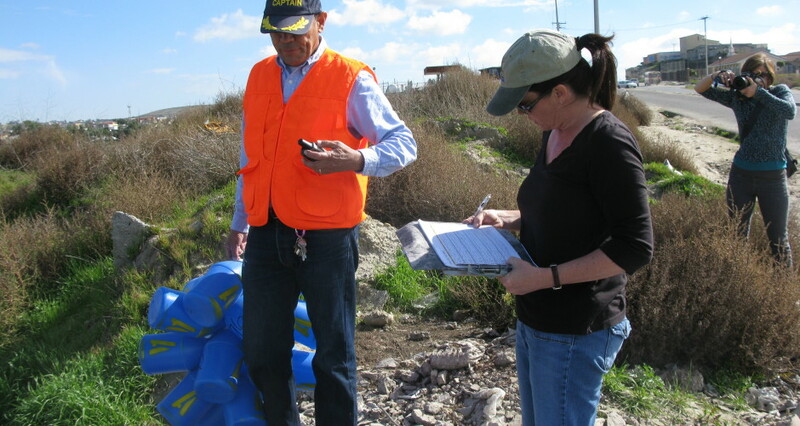 During phase I of this study, recording dump site locations and attributes was the first step in the process of working towards creating solutions to improve waste disposal policies in Mexico and the United States. 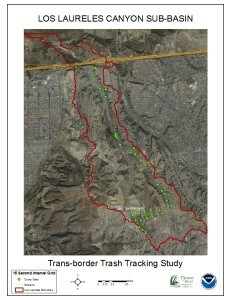 In phase, II our researchers provided proof of the transboundary flow of trash by locating approximately 20% of tracking devices on the U.S. side of the border in Goat Canyon sediment basins. For the past several months we have shared research results with stakeholders and officials in an effort to educate them on storm-induced pollution flows, international resource management, and cross-border waste management. 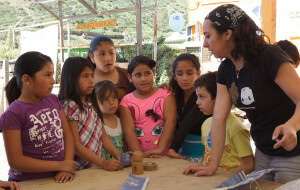 To date, we have presented this project to Tijuana’s Secretaries of Urban and Social Development. Secretary David Navarro and Secretary Miguel Medrano are both on board to cooperate in future studies. Both officials have toured the canyon and the estuary with Professor Romo, and both look forward to addressing the findings of our trash tracking research. We have also developed a website and presented the project to multiple stakeholders including: UC San Diego, TRVRT, SDRWCB, and Border 2012 Task Force.